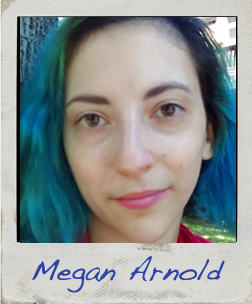 Megan Arnold has blue hair. That is a very important detail that you should know. At least, it was blue at the time this picture was taken. She lives in Enfield, Connecticut. It’s a small town with cows and lots of tobacco fields. As you might imagine, it’s not the most exciting place to live. Writing had always been her personal, secret door to another time and place. “384 Days” is her first story to be published, but certainly not her last. Read the first page of Megan’s story!